Papers and documents char at temperatures around 405°F. Guns are damaged by temperatures exceeding 500°F. 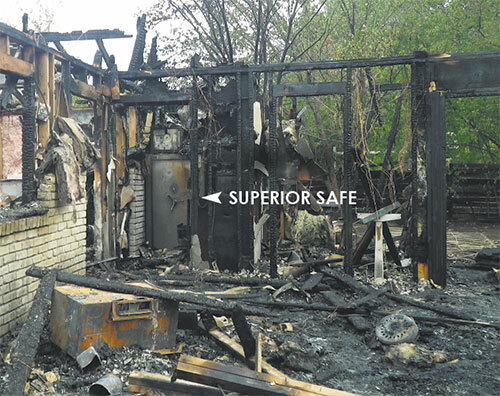 To protect documents and other possessions during a home fire, the internal temperature of a safe should remain below 350°F. This is why we include Superior Fire Protection standard on all models–so your safe’s contents will be protected from fire as well as theft. 1. Type and Amount of Insulation. Gypsum is the most commonly used material in home safes. When heated to 262°F it releases water vapor, which cools the safe’s interior. Until the moisture is baked out of the gypsum, the interior temperature of a safe will remain in the 200°F to 300°F range. Multiple layers of gypsum provide longer and higher ratings. 2. How Well the Fire Insulation Is Installed. 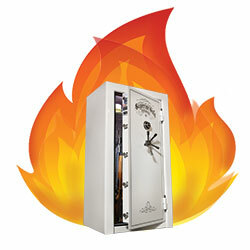 The inside of the safe should be fully covered with fire insulation, with no bare metal or hinge pocket cutouts. 3. Door Steel Thickness and Rigidity. Heat causes metal distortion. Temperatures above 1000°F quickly distort thin, light-weight doors in only minutes, causing premature fire seal failure, allowing heat to rapidly enter the safe. Intumescent (heat-expanding) fire seals, when heated above 300°F, can expand up to ten times their original thickness, sealing out heat. Double and triple step seals are especially effective at achieving ratings of over an hour. Rope or other types of non-expanding seals are not as effective.